Now, however, there were fewer people in the congregation than there were then, and I was leaving. I would not see the inside of this building again for quite some time, and when I did it would no longer be the same place. There would be a different name on the sign out in front, and the memories would echo more faintly within its walls. But on that night I stood on a threshold between one segment of my life and the next. I was also saying some of my last words to my old friend, Leona. I call her old not only because I’d known her a while, but because—and she’d have been the first to admit it, with a twinkle in her eye—she had more than a few years on her. She not only remembered this little Open Plymouth Brethren assembly from its humble beginnings decades earlier, and all the locations where it had since met; she remembered the Great Depression quite vividly, and from an adult point of view. She and her husband Al had gotten married just before it started. Leona was older than my grandparents, but not as old as my great-grandmother from County Mayo who came to America the same year the Titanic sunk and would pass away the following year. Leona was a feisty little thing, but now she faced me in a way that I was not accustomed to seeing her. Those shoulders of hers that always belied the frailty of her years seemed to droop under the weight of my imminent departure as she groped for words that could somehow make the finality we both sensed not seem like a complete rupture. I thought I knew what she wanted me to say. “I will never say anything bad about the Brethren,” I assured her, and a grandmotherly smile came to her face. The words seemed to touch the anxious place inside her. I’d like to think I’ve lived up to them. But I can’t say that those around me have always supported my pledge. At around that same time I had a phone conversation with a man who was highly placed in what little denominational bureaucracy the Open Brethren assemblies actually had. He was right. In all the years since he told me that I have never found Christians who exceeded the Brethren in either of these two areas. But it was too late. I didn’t realize it at the time, but I would never again find a longterm home in an Open Brethren assembly. So perhaps you can imagine my sense of irony when, several years later, I ended up on a chance phone call at work with that same man’s wife, who was calling for someone else. I told her I knew her husband from when I fellowshipped among the Open Brethren, but that I was no longer a part of them. “Thank God that you were delivered from that oppressive system!” she exclaimed with a harshness that clashed with her otherwise gracious tone. She told me her husband was leaving to join a major evangelical ministry outside the Brethren. This was quite a surprise. I had known that things were not going well in the particular area of work in which he had been involved, and that the assembly they and others had started was struggling, but I was startled by the intensity of her feelings. I might have inquired into the reasons for it if not for the fact that I had a desk full of things that needed to get done—and besides, she was calling for someone else. But it seemed that the man who exhorted me a few years earlier to never leave the Brethren was now leaving the Brethren. His wife had apparently already left. It would be nice if every time we parted company with someone we were exceedingly slow to assign blame. It would be nice if when people left churches or denominations they thought long and hard before broadcasting the causes of their dissatisfaction to the world. Sometimes it is necessary, but often it is only unnecessarily hurtful. I cannot say which one it was in her case. I cannot judge this woman, nor do I know whether her sentiments were reflected by her husband. Neither of them ever shared with me the specifics of their situation. But as I observe things, even when we’re not relying completely on prejudices and stereotypes we all still have a tendency to judge people and groups through the narrow aperture of our private experiences. When those experiences are painful, we often leave the teabag of our emotions to steep in the churning brew of bitter disappointment. It’s no different in the church. How many can let us down the way our fellow Christians can? How many can hurt us more deeply than those who are supposed to be our spiritual brothers and sisters? But that is a whole ’nother story. I’ll never forget one of my instructors at Emmaus Bible College, Jim Catron, who related an account of one of the most boring speakers who ever visited there. Jim was having a dreadful time listening until one moment when the speaker said something that made the whole experience worthwhile. If I recall, it was in the middle of a message about Joseph (who was no stranger to disappointment, hardship, and even betrayal) that he said, “Every wind of adversity is a vote of confidence from God.” It made a profound impression on Jim Catron, and it continues to do so on me today. I don’t know about you, but for me remembering that the God who watches over the sparrows cares even more for me, and has assigned a number to each hair on my head, is even harder than eating spaghetti without getting sauce on my shirt. But God doesn’t take us through excruciating experiences just because they are excruciating, any more than I held my six-month-old son’s arms and legs down just because I wanted to see him cry when the doctor gave him his vaccination. The fact is that I cried, too. I also cried when I left the Brethren, although probably not for all the right reasons. I licked my wounds. I did the kinds of things I usually do, trying to figure it all out. I read Marshall Shelley’s book, Well-Intentioned Dragons, and Steve Brown’s No More Mister Nice Guy, both of which I recommend, although the former may not be for the faint of heart. The book that helped me the most at that time, however, was one that diverted my attention from the apparent gravity of the situation. But before I get to it, perhaps you’ve heard of another book, this one by Norman Cousins, titled, Anatomy of an Illness as Perceived by the Patient, (New York, NY, USA: W.W. Norton & Company, Inc., reprinted 2005). Late in life Cousins was diagnosed with a crippling form of arthritis and was only given a short time to live. With his joints in so much pain that he found sleeping difficult, he decided to get proactive and devise a “program calling for the full exercise of affirmative emotions as a factor in enhancing body chemistry” (ibid., 43). A good place to begin, I thought, was with amusing movies. Allen Funt, producer of the spoofing television program called “Candid Camera,” sent films of some of his CC classics, along with a motion-picture projector. The nurse was instructed in its use. We were even able to get our hands on some old Marx Brothers films. We pulled down the blinds and turned on the machine. It worked. I made the joyous discovery that ten minutes of genuine belly laughter had an anesthetic effect and would give me at least two hours of pain-free sleep. When the pain-killing effect of the laughter wore off, we would switch on the motion-picture projector again, and, not infrequently, it would lead to another pain-free sleep interval. Sometimes the nurse would read to me out of a trove of humor books. Especially useful were E. B. and Katharine White’s Subtreasury of American Humor, and Max Eastman’s The Enjoyment of Laughter. I don’t remember when I first became aware of Cousins’ book and his unique ideas. Despite his success with “the laughing cure”—he lived another ten years, far longer than his doctors had predicted—the medical benefits of laughter remain clinically unproven. (Note: the FDA has not yet required comedy films and books to display labels warning users not to use them as substitutes for prescribed medications, although some will think that that’s a good idea.) But the emotional benefits of laughter are far from unproven; they are, in fact, self-evident. 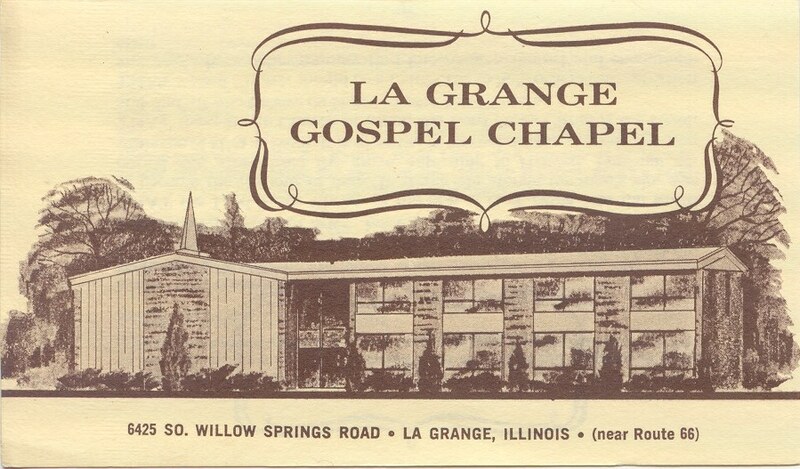 So one Sunday in the mid-’80s I was speaking at Oak Forest Bible Chapel, and an older couple had my wife and I over for dinner after the morning service. I was to speak again that evening, but before that time came they introduced me to a Sunday afternoon ritual they’d been observing for some time: listening to Garrison Keillor‘s radio program, A Prairie Home Companion. I had never heard of him or it, but I was soon hooked. I learned that Keillor was raised in the Plymouth Brethren—albeit the Exclusive wing—and that he had a bestselling book out called Lake Wobegon Days, (New York, NY, USA: Penguin Books, 1986). In Lake Wobegon Days he described his Brethren upbringing, but he (probably wisely) chose to change the name from Plymouth Brethren to “Sanctified Brethren.” He even provides an engaging footnote on Brethren history (ibid., 132-133), the amusingly-disguised details of which should be vaguely familiar to anyone who’s read F. Roy Coad’s classic, A History of the Brethren Movement (Vancouver, BC, Canada: Regent College Publishing, reprinted 2001). Keillor’s experiences and perceptions differ at many points from mine, since I was not born and raised among the Brethren as he was. Not to mention that he was from rural Minnesota, while I was from Chicago’s suburbs. He grew up in the ’40s and ’50s; I grew up in the ’60s and ’70s. He was drawn to radio; I was drawn to ministry. He is hugely successful…okay, maybe I should stop here. But as I began medicating my emotional wounds by cuddling up to his book’s fifth chapter, “Protestant,” the overlap between his world and mine soon became obvious. And in that overlap, my soul could use affectionate laughter to help it understand the events of the previous dozen-or-so years. …in a town where everyone was either Lutheran or Catholic, we were neither one. We were Sanctified Brethren, a sect so tiny that nobody but us and God knew about it, so when kids asked what I was, I just said Protestant. It was too much to explain, like having six toes. You would rather keep your shoes on. At last, there was someone who could express the way I felt, and in a way that made me chuckle. Garrison Keillor and I probably disagree on some subjects, but he taught me some important things, like how to remember strange, confusing, and even painful incidents with affectionate laughter, and how to keep folks with whom you’ve parted company lodged in a warm room in your heart. It’s not that God had not been putting people in my life to teach me this all along. Dave Glock, who was the academic dean at Emmaus when I was there, always made me laugh, and in many other ways he also modeled the lessons I would eventually learn, despite myself. He also occasionally commented on the difficulty of explaining Brethren assemblies to outsiders. This entry was posted in Plymouth Brethren. Bookmark the permalink.